In 1809, Spain was defeated by Napoleon’s forces. This caused the people in Central and South America, who were controlled by Spain, to question their leadership. Due to the Spanish defeat, Chile and Buenos Aires declared themselves independent. Peru, the capital of Spanish power in South America, was attacked and defeated by rebels and in 1821, Jose San Martin and his rebels entered Lima and declared Peru an independent state. Another leader was rebelling against Spain at that time. Simon Bolivar spent time in Europe learning about the Spaniards. He used this knowledge to gain independence for Columbia, Venezuela, and Central America. He later captured Peru as well in hopes of creating a union among South American nations, but was unable to do so due to internal conflicts. When Spain fell to Napoleon’s forces in 1809, it set off a string of rebellions in Central and South American colonies. Spain’s colonies in Central and South America saw that Spain could be conquered when Napoleon’s forces defeated Spain. They said to themselves, “Why should we still be listening to Spain? Spain is way across the ocean. Spain’s ruler is not here telling us what to do. We should be our own rulers.” They felt like it was a good time to break free. Spain was already occupied across the ocean in Europe fighting off Napoleon’s forces or rebuilding after Napoleon had defeated Spain, and the people realized Spain was weakened. Spain wasn’t in a position to really fight with them right now, and they felt like they could get their independence at this time. Peru was the stronghold of Spanish power, so people who actually were dignitaries from Spain who were sent there to rule those people would have been in Peru. The rebels who were promoting this independence movement all went to Peru to attack the government there. They were led by Argentinean Jose San Martin, and the rebels entered Lima, the capital of Peru, and declared Peru an independent state in 1821. Peru couldn’t declare itself independent right away because that was where all the Spanish power was centralized, but the rebels came in and helped them and Peru declared its independence as well. The greatest military leader of the independence movement was not Jose San Martin, but Simón Bolivar. Bolivar had traveled extensively in Europe, so he used his knowledge of the enemy to run the Spaniards out of Columbia, Venezuela and Central America. Bolivar had traveled through Europe, they knew the ways of the Spanish, he knew their language, he knew what would work and what wouldn’t, and so he used his knowledge of the enemy knowing their weaknesses, knowing where their strengths would be, and he ran the Spaniards out of Colombia, Venezuela and Central America. He ran them out of a great area where they had colonized previously, and that left several of the countries independent now. Bolivar eventually seized control of Peru as well, and he did that hoping to form a great union of South American nations. There were all these nations that had declared themselves independent, and Bolivar wanted to make them all join together to form a great union of South American nations. However, this alliance was eventually destroyed by internal feuds. They did form an alliance under Bolivar with his pushing for it, but it didn’t last that long because there was still a lot of internal feuding between the different nations, so they split back up into their individual independent nations. 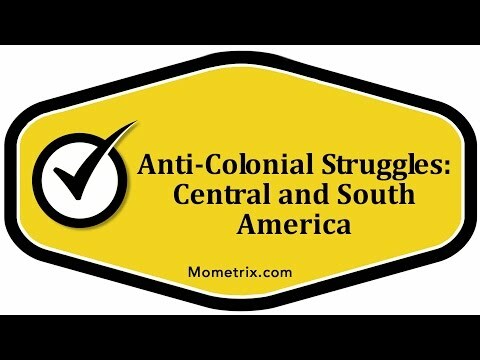 Central and South America during this period of anti-colonial struggles rebelled against their mother country of Spain when Spain was weak after losing to Napoleon’s forces. They started declaring their independence, rebels pushed the Spaniards out of Lima, the capital of Peru where their power was centralized, and also ran them out of all the other countries that they had been dominating. Eventually, they were almost all independent nations and Simon Bolivar tried to get them to join together in one union. They did, but it only lasted briefly and then they went back to being independent individual nations.